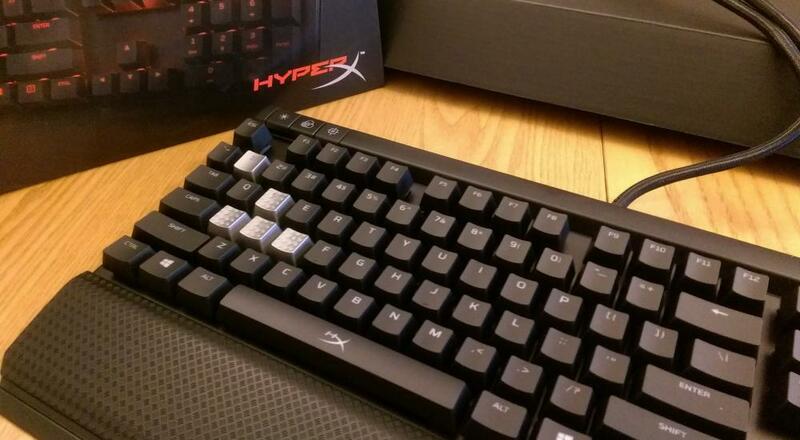 You may recall that I was extremely impressed with the HyperX Alloy when I reviewed it back in October 2016. As someone who never cared to get in on the mechanical keyboard game, the Alloy converted me, winning me over with its compact design and no-nonsense features. Given that background, I was fairly certain I would also like the Alloy Elite. Let’s start with what’s very similar or the same between the Alloy Elite and last fall’s Alloy. The main part of the keyboard is much the same, complete with a sturdy and compact solid-steel frame that still hosts a USB port along the top of the keyboard (a feature I would have sorely missed had they removed it). The power cord is a fully detachable woven cord that requires two USB ports to power, just like the Alloy. 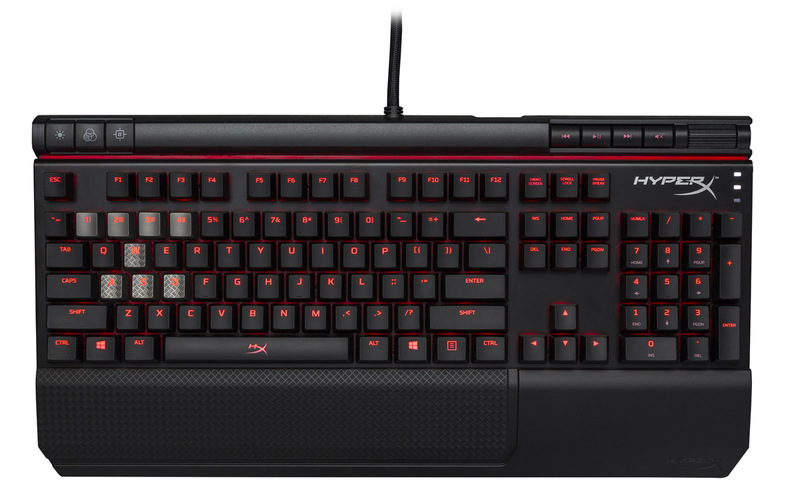 Both keyboards are fully plug-and-play with absolutely no software (a HyperX standard). The Alloy Elite features the same red LED backlighting as the Alloy, with the same backlight modes (Solid, Breathing, Trigger, Explosion, Wave, and Custom), though the way you toggle between them is slightly different (see below). They keycaps are all fully removeable and the Alloy Elite also comes with specially colored W, A, S, D and numbers 1-4 keycaps, though this time they’re platinum-colored instead of red. The W, A, S, and D keys are still textured and the 1-4 keys are still slightly raised. 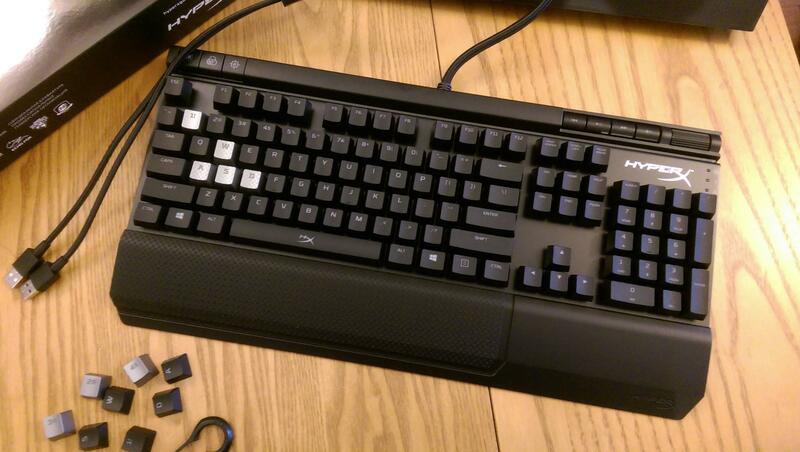 Both Alloy and Alloy Elite come with Cherry MX switches, with Red, Blue, and Brown switch options (my Alloy came with Cherry Blues and my Alloy Elite came with Cherry Reds). The most noticeable differences are along the very top and bottom of the keyboard, which are extended compared to the Alloy. Along the bottom is a detachable wrist rest, which I was actually quite excited about since I’ve required wrist rests and wrist braces for years when gaming; however, it ended up being nothing exceedingly special. It’s fine and it does the job, but it doesn’t have any special padding. It’s made out of hefty plastic with soft-touch coating that makes it smooth to touch, and for my own personal preferences it’s slightly low, though I’m fairly certainly I like to elevate my wrists much higher than the average gamer. Along the top of the board is a media panel (on the right) and keyboard feature panel (on the left). The media panel allows you to pause/play, skip between tracks, and mute the audio of a media app you’re watching or listening to. You can easily do so when you’re in another program or playing a game, which is convenient. There’s also a volume control wheel, which gets major style points for actually being a huge metal cylinder that’s embedded inside the top of the panel. Its unconventional design is functional, too, as I have yet to accidentally bump it (something that can often occur with standard plastic wheels along the sides of panels) and it’s easy to quickly locate and spin up or down without looking down. Page created in 0.5774 seconds.